Three weeks ago, storm troopers, Jedi knights, and cult comic book and movie characters roamed the streets where I live. 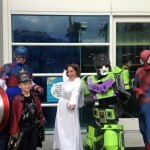 COMIC CON–the biggest pop culture event in the WORLD invaded San Diego. 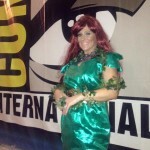 I made people “itch” as Poison Ivy–and really loved being a red head! And, I was told I had “GREAT BUNS” when I dressed up as Princess Leah. 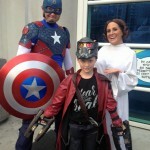 Yes, the reporter in me completely “dived in” to cover the many fascinating stories Comic Con brings. And, as a LIFE COACH, it made me think a lot about the concept of SUPERHEROES. Those with extraordinary powers, who defy all odds, to overcome incredible challenges and save the day. Sure, there’s Batman, Captain America, and Wonder Woman. But, what about all the EXTRAORDINARY “ORDINARY” people who are Superheroes in our every day lives? The moms, dads, teachers, and friends who come to our rescue when we need them the most for comfort , community, and support. The checker at the grocery store who flashes his infectious smile, and you suddenly forget why you were having a bad day. 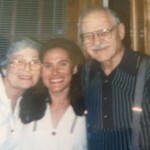 For me, growing up, my SUPERHEROES were always my Grandma Bea and Grandpa Mickey, now smiling at me from Heaven. In their eyes, I was more precious than GOLD. More beautiful than a thousand shining stars. And capable of doing absolutely ANYTHING I truly desired. Their unconditional love, faith in me, and constant encouragement made me feel as strong as any superhero., Okay….I could never fly, be invisible, or scale a building. 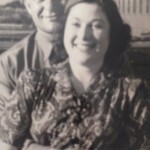 But, the way my grandparents believed in me, really TREASURED me–made me FEEL like I COULD! Who are YOUR Superheroes? Have you told them how they brighten your day, soothe your soul, or make life so much FUN?! C’mon….you can do it! 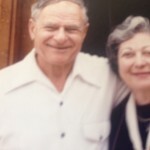 What a gift it would be for both of you if you could TELL THEM TODAY. I bet it would make them feel like they could FLY! And know that, YOU–YES YOU– are a SUPERHERO–full of love, light, joy, wisdom, and an abundance of strength….a WONDER WOMAN!!! No “lasso of truth” required.